This post is about why I do not think that GWT RPC is something valuable to be carried forward. I am also being slightly harsh with GWT RPC which has served many GWT applications as a good RPC mechanism. Please keep in mind that this post is not about assigning blame, I do think that the engineers who designed GWT RPC did a great job, they just had other more important goals in mind. When I first discovered GWT RPC in somewhat 2008 I thought it was magical. Send all my Java objects over the wire and just use them on the client side. All I need to do is define a simple interface. I loved it. Why do I need to pass in the synchronous version? From a type perspective this does not make any sense what so ever. The synchronos version extend the RemoveService interface, the asynchronos version did extend nothing. Why not simply use the Asynchronous version all the way? If you know what a GWT.create call looks like in the compiler you realize that this is really broken. Let's take a look at the second problem that GWT RPC has that is way more severe. The interface defines a simple method that takes a list of strings. The problem with this code becomes apparent when we take a look at the serializers and deserializers that have to be generated for this class. Since we need to have a serializer for every concrete type that we have in the program, you end up with potentially hundereds of serializers just for this one method. The GWT team always recommended to be as specific as possible to get rid of this flaw, but this is against a core design principle in Java. We want List on the interface, not ArrayList. Doing a simple search for subtypes of ArrayList in a hello world GWT applications returns 16, this is obviously a bad choice. Because of the need for serializers that were specific to your current applications, GWT RPC had a serious issue with version skew. Make a slight changes to your problem and you might have ended up causing GWT RPC to fail between these version of your app. When you have multiple thousand servers running you will always have an old client talking to a new server or an old client talking to a new server. Not dealing with this is unacceptable for a RPC system and has cost many teams at Google headaches. "Who is implementing this interface?" "Who is subclassing this class"
This means that you can not incrementally compile GWT RPC code since you would not be able to answer these questions correctly. The only reasons that super dev mode works with GWT RPC is that we do the initial slow full world compile and then keep track of these types as you update your code.If you want really fast compiles, which we want for GWT 3.0, you really do not want any global knowledge. All other GWT code generators can be changed to be Java annotation processors, since they do not require global knowledge. Since GWT RPC requires global analysis it can not be easily ported. But I really like GWT RPC, what can I do? - Make the serialization format compatible with different versions of your app, by the way this is what we do with GWT proto RPC, which unfortunately is not open source. I hope this blog post helps people that really like GWT RPC to understand why there are better choices one can make for a RPC mechanism and why we should be striving to have something better. I just finished the gwt-phonegap 3.5 releases and pushed it to maven central. This is now fully compatible with Phonegap 3.5 and GWT 2.6. It contains many bug fixes and improvements. This version fully works with mgwt and already uses the new mgwt 2.0 for its showcase. If you come the Silicon Valley these days you will spot Teslas everywhere, but not here in Germany. A couple of days ago I saw my first Tesla driving around in Munich, being a car nut I immediately needed to get my hands on one here. You will run out of battery on a german autobahn pretty soon, since driving high speeds is very energy consuming. Tesla just solved the battery problem by offering battery swaps as well as extending their super charger network. Today I can already drive from Munich to Dusseldorf without problems and this network is growing rapidly. Having the battery swaps means that you do not need to care about range anymore since getting new energy will only take 90 seconds. The oomph that is provided by the performance plus version with its 600 Nm is quite exciting to drive, but it is still lacking in max speed. If I spent 125 thousand euros on a car, I expect it to at least go 250 km/h or even more. A BMW M5, a Porsche 911 turbo, Mercedes AMG 63, all these cars can easily hit 300 km/h on a german autobahn. This is not a theoretically number, people actually drive this fast in Germany. This is still a problem for Tesla in Germany, but other than that I would now prefer a Tesla any time over the other cars and will probably soon get one. After driving the car I also wanted to see how much the onboard system can actually do. This is running a version of the QT webkit based browser. 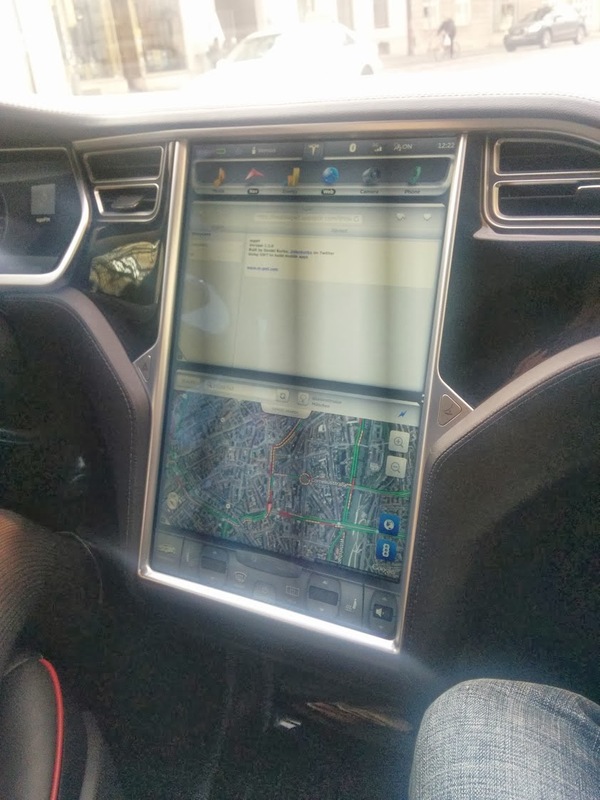 The complete mgwt showcase was working and you could even think about using a Phonegap approach to build UIs for the car. This is why we added source maps support to the v8 profiling tools. Using a special GWT linker you can now profile your GWT application in d8 and get back Java line numbers. This is one of the things that we did to help the our colleagues to make Google Sheets as fast as possible. Build your version of v8 using these instructions. After that make sure that d8 (most likely under out/native) and the tickprocessor (tools/mac-tick-processor or tools/linux-tick-processor or tools/windows-tick-processor.bat) are available in your path. With the changes we made to v8 and GWT you can now use the great v8 toolchain to spot performance problems in your GWT applications. These tools will also allow us to improve the way the GWT compiler translates code in order to make it run faster as well as improving the standard libraries that come with GWT. You can look forward to your GWT applications running faster in the future. I finally found some time to write on my impression of the first GWT.create conference in San Francisco and Frankfurt. I have been involved very early with the conference and helped in some aspects to make this a success, but it turned out even better than all the people behind GWT.create hoped. Before I go into any more detail let me quickly thank Vaadin, who not only invested a big amount of money and time to make this conference a success, but also made sure that this conference was not biased towards Vaadin and was a good platform for all people of the GWT community (such as Sencha, Readhat and others). In both locations we had 646 attendees, which is huge for a first time conference, but what I liked even more is the fact that we had very good GWT content: All the talks got an average rating of 4 out of 5. We had very exciting talks from many GWT team members that showed where we want GWT to be in one or two years time. All the slides are already published on gwtcreate and talks will be published on youtube over the coming weeks, so if you could not make it, you still get a chance to watch the talks. One of the most valuable session was the panel discussion, in which we could listen to the communities input. I think the discussion around super dev mode and IE8 were very valuable and we will take our conclusions from that. I personally spoke to so many GWT developers that were building amazing things using GWT. I was completely amazed. One of the most notable things to me was a camera which uses GWT for its UI. Ray also introduced one new Google product which is leading the way with writing once in Java and running your code everywhere: Google Sheets. Brian showed off his work on super dev mode and what we are going to do to make it as good or even better as dev mode. If you combine this with John's and Roberto's work to make the GWT compiler work incrementally, we have a very good story for developer productivity in 2014. Matthew presented on the status of the GWT open source project. We are seeing strong contributions from outside of Google. There was one we specifically wanted to highlight. Julien Dramaix presented with me on CSS3 and GSS support in GWT, which he did as a complete open source contribution. Erik presented on testing with GWT and his great open source project gwt-mockito and Rob on an architecture that we use inside of Google for really large applications called Turducken. There is so much more great content I want to talk about, but I guess I should leave this to separate blog posts. Combine all this work and we have a very good story for GWT in 2014. Since GWT.create 2013 was such a huge success, we are already planing on setting up something bigger for 2014. There is still time to get your ideas into the 2014 google moderator. I am very happy to see that so many people got involved with this conference and joined us in the contributor workshop. I felt so much appreciation for our work that I am really happy to be working on GWT and with this great community. Today I got around to release gwt-phonegap 2.4. This is now fully compatible with Phonegap 2.4 and GWT 2.5. It contains the new APIs such as the InAppBrowser and the Globalization API. This version fully works with mgwt. Today David Booth came through and together with Vaadin composed the complete results of the GWT survey. A really big thanks for all the work they have done! You will discover a lot of comments in the document from me, but let me outline a few important decisions. GWT is very healthy: about 90% of the people doing GWT would choose to use it for their next project as well. I was amazed by the number of people who are using mgwt / phonegap to build their projects for mobile. The three main things which I felt were missing from GWT (fast compiles, a better CSS3 parser and more great looking widgets) were named a lot in the survey. The good thing is we are already working on the compile time with super dev mode which will have it's best days still ahead. Fast and beautiful widgets that leverage new browser features are still missing, but if you take a look at mgwt this can be done pretty easily. Why don't I build something for desktop as well? Those are just some quick thought, read through the report yourself and make up your mind. GWT is healthy with a very good community.